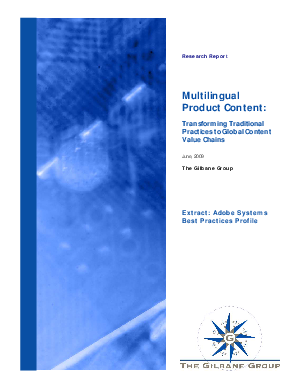 > Jonckers Translation & Engineering > Multilingual Product Content: Transforming Traditional Practices into Global Content Value Chains. Localizing content poses specific issues for technology companies. This case study examines Adobe's globalization efforts in transforming traditional practices to global content value chains and outlines how Adobe's been able to do it successfully. What you'll read about in this case study: Content Globalization Challenges, Adobe's Global Content Value Chain - Techniques, Strategies, People, and Infrastructure needed for scalable, flexible infrastructure (broken down in a chart); The importance of partnering with a Localization company, such as Jonckers, to help implement and maintain your global product content value; Results (cost savings, customer satisfaction, quality improvements); A view on why Adobe has been so successful in its efforts. If your company is interested in improving or expanding its markets on a wider scale, this profile of Adobe's best practices is a must-read. Download this free case study now.